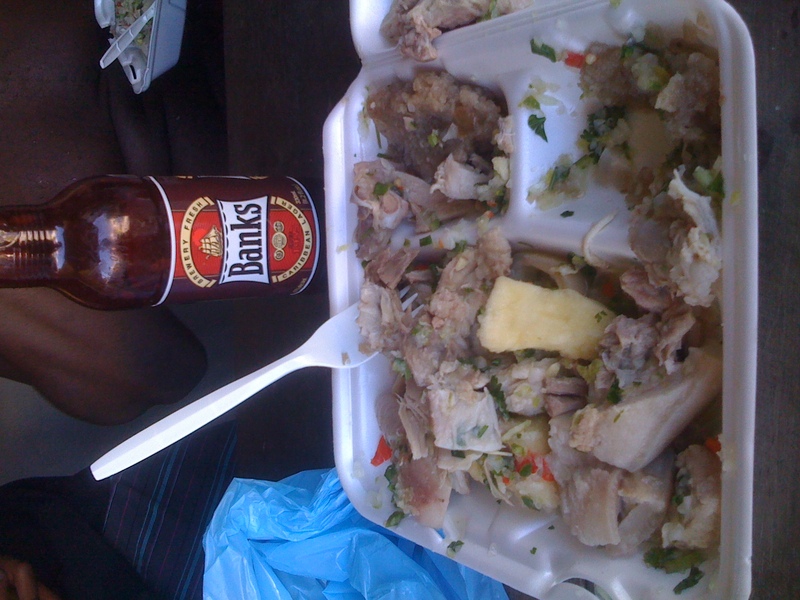 A traditional Barbadian delight, hot or cold, Pudding and Souse is relished by almost all Barbadians. They can be found eating this delicacy mostly of a Saturday afternoon, at the Horse Racing, on the Cricket boundaries, at the beach…in fact, anywhere. The Pudding (Not meaning Dessert) can be black or white, depending on your preference. Black Pudding is either dyed- more common nowadays- or takes its colour from the blood used in its preparation. White pudding is unadulterated sweet potato which is the substance of the pudding itself. The souse is boiled and pickled pork specially prepared to be a true compliment to the pudding. I consider myself to be pretty lucky in that the client whose project I’ve been working on for the past few years is based out of Barbados. I’ve been able to visit the island a few times over the course of the project and on my first visit I stayed over the weekend to explore. I had two objectives– scuba diving and eating all the local food I could get my hands on. The client was nice enough to cater our meeting with an amazing local spread of fried flying fish, rice and peas, and a delicious bread pudding with Mount Gay rum sauce. After seeing how enthusiastic I was about dousing my food in the local Bajan hot sauce they thought I was ready for the ultimate in Bajan cuisine – Saturday pudding & souse!